What a great evening the fetching Mrs. B and I have in store tonight at Jones Hall to enjoy the great Houston Symphony Orchestra. This concert will be special as virtuoso violinist extraordinaire, Joshua Bell, will be in Houston to perform Tchaikovsky's Violin Concerto in D Major. If that wasn't good enough, one of my favorite pieces, Sir Edward Elgar's Enigma Variations is also on the program. The Tchaikovsky Violin Concerto ranks with the Brahms, Mendelssohn, and Beethoven concerti as among the greatest ever composed. In my opinion, I would rank the Tchaikovsky number one. This concerto is filled with drama, excitement, and triumph throughout. The first movement, Allegro Moderato contains the theme used in the movie, The Right Stuff [which is about the first astronauts in America's space program]. That theme is displayed exuberantly by the orchestra at the 6:20 mark. Get ready as it just may make you jump from your seat. While Houston patrons in Jones Hall know very well there will be two more movements after the first, I predict, from experience, that they [we] will have a big ovation for Joshua Bell after the first movement [which is usually held until the finish of the concerto] for 3 reasons. 1. To honor Tchaikovsky's great movement. 2. 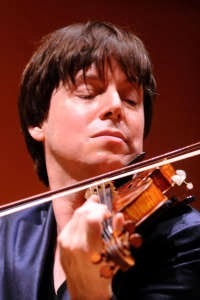 To honor Joshua Bell's great display [I am positive] of virtuosity. and 3. Because the movement ends in such a rousing climax that begs for applause. As Tales wants to share just a little of what Mrs. B and I will be seeing and hearing when we go to Jones Hall tonight, I include the ultra beautiful Nimrod variation, the 9th variation, of Sir Edward Elgar's Enigma Variations. When you hear these videos I am sure you will be saying to yourself, I wish I was there. So, turn up the volume and enjoy a little of what we will enjoy tonight. UPDATE: Wow, what a concert by the Houston Symphony Orchestra. Every piece was magnificently played under the baton of Lawrence Foster [who many years ago was once the director of the Houston Symphony Orchestra]. I predicted in the post that Joshua Bell would receive a good ovation at the end of the first movement. He not only received an ovation, but it was a rousing standing ovation that lasted for minutes. That is the first time I can ever remember that a soloist had received a standing ovation at the end of the first movement. Joshua Bell deserved it. Than at the end of the concerto with its exuberant finish, Joshua Bell and the orchestra and conductor Foster received a sustained standing ovation that lasted at least 5 minutes whereby Joshua Bell had to return to the stage four times. That was the best solo violin performance I have ever seen. Bravo Joshua Bell! Bravo Houston Symphony Orchestra! :-) I wish you and Leslie could be there.